HP and Samsung About to Team Up for a Mobile Printing App | TonerGreen - Eco-Friendly Toners from the U.S.
HP, also known as Hewlett-Packard, one of the largest U.S. multi-national company was said to be teaming up with the large South Korean electronics firm Samsung, the manufacturer of the famous Samsung Galaxy S3, in creating a new embedded mobile printing application. According to an article published at theVARGuy.com written by DH Kass, HP and Samsung embedded mobile printing app will be designed to allow "Samsung phone or tablet users to print from their devices straight to an HP printer on a local network or through wireless direct print." The possible collaboration of the two major OEMs aims to what Hewlett-Packard referred to as "a common need for today’s mobile user"--a mobile printing application that has the ability to print on demand from anywhere at any time. According to the said article, the embedded mobile printing application also "differs from other mobile printing apps on the market in that it doesn’t require any setup, tools, drivers or network configuration adjustments to a mobile device, according to HP. The app supports printer settings and options such as duplex printing, color, orientation and paper type. HP’s mobile print lineup also includes HP ePrint." 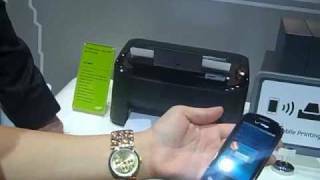 This specific mobile printing solution will be available in the Samsung Galasy S4, and will also offer a firmware upgrade to the Galaxy S III and Note II to enable both devices with wireless printing capabilities. Happen to be looking for Samsung and HP printer supplies? TonerGreen is an environmentally-concious online store that has been providing environmentally responsible printing solutions which included eco-friendly HP toner cartridges and Samsung toner cartridges. Our products are not just ordinary recycled toner cartridges because recycling is just a small part of the meticulous remanufacturing process that our products undergoes, we make sure that they will live up to your expectation while being eco-friendly at the same time.